The mineral zinc pays a very important role in the body. Adequate level of zinc must be ensured to promote optimal functioning of the body. If the level of zinc exceeds the therapeutic level, it will lead to an overdose and lead to adverse effects [1, 2, 3]. The trace element zinc is an essential component of greater than 300 enzymes that is required by the body for metabolism. It is also known that zinc has a major role in the growth and development especially during childhood, adolescent period and pregnancy. Zinc is primarily found in food such as red meat, seafood, nuts, cereals and daily products. Like magnesium and potassium, zinc is also found in food supplements and these help in preventing the deficiency in essential minerals. Low levels of zinc lead to impairment of wound healing, hair loss, impairment in the sense of taste and smell and nerve conduction delay [1, 2, 3, 4, 5]. How much is Zinc Toxicity? The recommended intake of zinc in the body is about 9.5mg. Symptoms of toxicity may start to manifest when an amount of 200mg of zinc is being taken. This is possibly due to an increased intake of acidic food or drinking from a zinc-coated canister or container. Industrial hazard like inhalation of the fumes of zinc oxide from paints also increases the amount of zinc in the body. Certain medical conditions can contribute to the increase in the serum zinc level. Renal injury can prevent the excretion of zinc and may lead to an accumulation in the body. Individuals diagnosed with haemochromatosis or an overload in iron promotes increased absorption of zinc from the diet or supplements [1, 2, 3, 4, 5]. What are Zinc Toxicity symptoms? 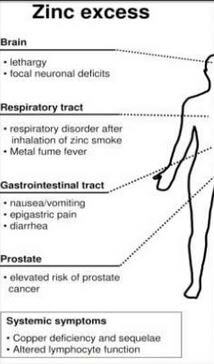 The symptoms of the toxicity depend on whether the overdose occurred as a result of ingestion of high level of zinc at one time (acute) or due to the prolonged exposure to excessive zinc (chronic). These types are also seen in lithium toxicity. Taking more than 200mg of zinc can cause diarrhea, vomiting, nausea an abdominal pain. The patient may also report dizziness, headache and appear lethargic or irritable. Chronic zinc toxicity affects the normal function of the hard and may impair the production of pancreatic enzymes. Other symptoms of toxicity due to inhalation include chest pain, arthralgia, myalgia gastroenteritis and rigors [1, 2, 3, 4, 5]. 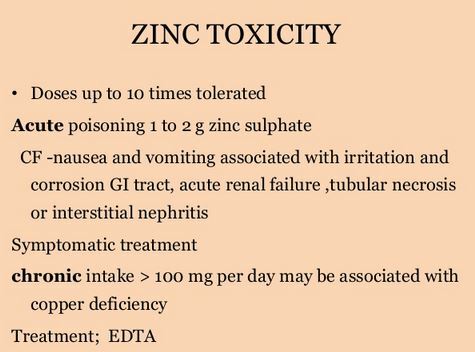 What is Zinc Toxicity management? If a person is suspected of overdosing on zinc, the local poison control should be contacted immediately. Information such as the amount swallowed and the time the ingestion have occurred is important in the management. If the toxicity is caused by ingestion of food supplements, the medications should be stopped immediately. If toxic fumes are the reason for the toxicity, the person may have to be placed in a zinc-free environment for about 24-48 hours. Other symptoms that have developed are managed through the use of medications and supportive care. Serum zinc level is continuously monitored until it returns to the normal level [1, 2, 3, 4, 5]. How to prevent Zinc Toxicity? The labels of food supplements must be checked and the physician be consulted before taking any food supplements. Inhalation of toxic fumes can be prevented by wearing appropriate personal protective gear. Any potential dangers of inhaling zinc fumes must be reported immediately to prevent any incidents in the future [1, 2, 3, 4, 5].